Steady Roller - The friendlier dice roller for board games! 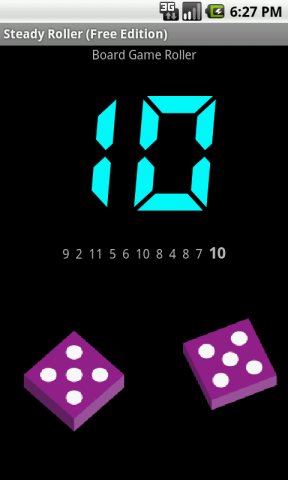 Steady Roller is an Android dice rolling application that makes the results of rolling two 6-sided dice feel a little more in line with your intuition. Ever played Settlers of Catan and wondered why there were no 3s for the entire game? Or four times as many 7s as there should have been? Steady Roller, when placed in "Board Game" mode, will try to keep that sort of thing from happening. 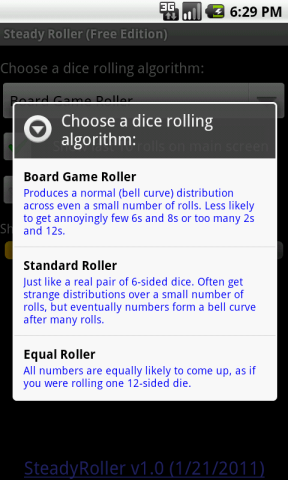 Of course, it's also capable of being a completely neutral dice roller, too - just put it in "Standard Roller" mode. 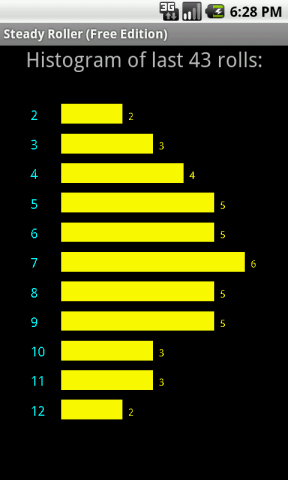 Shake it or swipe sideways to roll a new number. Adjust the shake sensitivity with the slider on the Settings page. Copyleftrightandcenter © 2011-2013 - Anonymoose, LTD.